The process of putting the name of the governor of the Central Bank of Iraq on the new edition of the currency for a wide media, but a number of experts in the economy and law have confirmed the "eligibility" of the central bank to put the name of the new monetary categories, and the procedure is in place in most countries of the world. The specialists said that "the uproar that some media institutions did not have knowledge and know-how in the economic affairs and monetary policy is to ignite the crises and the aim of personal squandering." In the opinion of the banking expert Majid al-Suri in an interview with "Economy News", "The head of the monetary authority has the right to carry out the process of signing with the name and there is no legal sense of any objection," noting that "the law of the Central Bank allows the name and signature of the Governor of the Bank to minimize Of counterfeiting the currency and makes it difficult to falsify and is one of the safety signals that are placed to protect currencies. "Many countries (such as the United States, the United Arab Emirates, Egypt, Turkey, Malaysia, Saudi Arabia and Jordan) are being named and signed by the governor," he said. Iraqi rather than a conservative person. " For his part, said economic expert Bassem Jamil Antoine in an interview with "Economy News", "The uproar caused by the ignorance of many media about the role of currency, which is the economic front of the country." He added that the Central Bank did not violate its law, which stipulates that it is considered an independent body, which allows the governor to put his name and signature. And that discussion of the subject could be left to the House of Representatives away from media fallacies. He said. "A person can not be prosecuted and convicted unless there is a legal offense against him, and if this is not available, it is a personal demarcation process," he said. In turn, the legal expert Tariq Harb said in a press statement, "The name of the governor on the second edition of the banknotes issued to some groups is not a violation of any legal, but an administrative measure in force in most countries of the world." 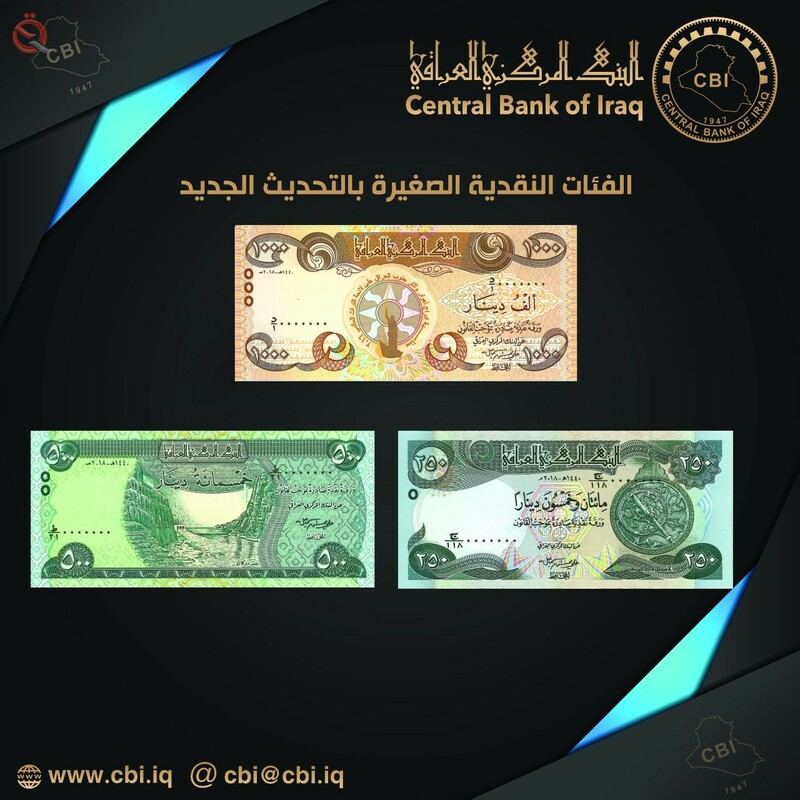 On Monday, the Central Bank of Iraq issued a clarification on the existence of the name of the Governor of the Central Bank of Iraq Ali Alalak in the new edition of the currency. The Central Bank of Iraq said in a press statement received by the "Economy News" that "one of the basic functions of the work of the Central Bank of Iraq and provided for in Article IV of Law No. 56 of 2004 amending the" Issuance of the Iraqi currency and management, as stated in Articles 32 and 33 of the same law where " The Central Bank of Iraq alone without the right to issue currency currency paper and metal for the purpose of circulation in Iraq. " He pointed out that "the banknotes in various countries contain the signature of the Issuing Authority, which is the Governor of the Central Bank. Central banks have always put signatures of their governors on these securities in different forms." Among them are the signature of the Governor, In the handwriting of the governor in the form of the name combination with a signature with special significance to the banknotes. Many central banks use this combination (name of the governor by hand) without signing to document the stage of issuance of the banknote. He continued, "Of these examples Iraqi currency issued in 1932 as signed by the same formula Governor of the Central Bank of Iraq in 1964 and followed the approach of the central banks of Egypt, Saudi Arabia, UAE, Lebanon, Turkey and others, so the Central Bank of Iraq decided to include the name of the governor when reprinting or issuing any cash , In line with what was stated and with the latest trends found in the signature alone, the lack of significance required by the word (governor) on the banknote and that the currency committee in the Central Bank of Iraq concerned has taken this decision for months in accordance with all legal considerations and Organizational and international practices ".